This is a chipping sparrow, named because of the sound it makes. It "chips" so fast it could sound like a sewing machine. The first time I heard and identified one, I couldn't believe a bird could make that noise. They're small and really cute, with that chestnut cap on top. 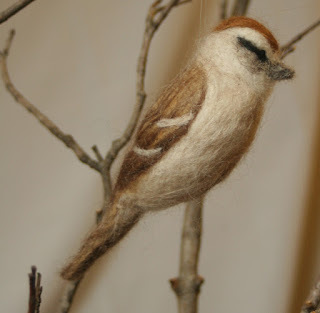 Hei !Nice blogg :)I love your sparrow, I`ts beautiful! I like to needlefelt myself. Thank you!! What do you felt? I`m a newbie at this. I like to do people, animals and toys. I have tried to felt a Blackbird too:) Do visit my blog and have a look.